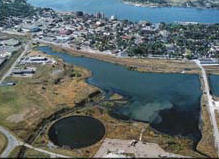 An aerial view of the Sydney tar ponds. SYDNEY - The Cape Breton Regional Municipality and the Sydney Tar Ponds Agency have been using the coffer dam in a bid to flush smelly sewage out of the ponds. Mike MacKeigan of the municipal public works office said the agency has kept the dam wide open this summer, allowing the ponds' natural tides to flush out the millions of litres of raw sewage that flow into them each day. He said if the dam is kept closed, sewage can settle at the bottom of the ponds and begin to break down, causing foul odours. But leaving the dam open can cause a big stink if conditions are dry and water levels in the pond get low. He said that's what happened in June, when the smell of raw sewage pervaded downtown Sydney. Frank Potter, an agency engineer, said the agency and municipality have experimented with opening and closing the dam, trying to combat the odour. But he said smells develop either way. Last year, 4.8 kilometres of new sewer pipes were installed to divert Sydney's sewage out of the ponds, in the centre of the city, and into Sydney Harbour. But council decided not to use the new pipes until a sewage treatment plant is built on Battery Point. The coffer dam was built in 1993 to keep a constant pool of water over the ponds to facilitate dredging, part of the first attempt to clean up the site. Mr. Potter said the cleanup of the ponds over the next 10 years won't be slowed by smells or sewage in the ponds. The treatment plant is expected to be open by May 2005, at which point sewage will be diverted from the ponds and the smells should disappear, Mr. MacKeigan said.